It’s popcorn on a stick! 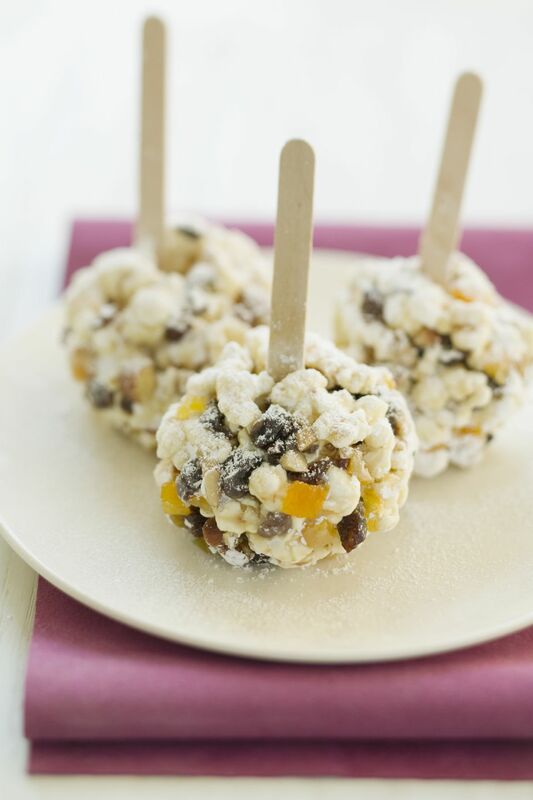 Flavorful caramel popcorn is formed into balls and served on a stick for a treat kids of all ages will enjoy. The caramel in this popcorn stays soft and chewy, so you don't have to worry about the popcorn getting too hard or crunchy on these pops. You can always get creative and add other mix-ins to the popcorn, like nuts, dried fruit, or your favorite candies. 1. Spray a large bowl with nonstick cooking spray, and place the popped popcorn in the bowl. 2. In a medium saucepan, combine the corn syrup, brown sugar, salt, and butter. Stir until the butter and sugar melt, then add the condensed milk. Bring the mixture to a boil, stirring frequently, and insert a candy thermometer. 3. Continue to cook the candy, stirring frequently, until it reaches 230 degrees F (43 C) on the candy thermometer. 4. Once at the proper temperature, remove the pan from the heat and pour the hot caramel over the popped popcorn. Stir until the popcorn is entirely coated in the caramel. 5. Let the popcorn cool for a few minutes, until it is cool enough to comfortably handle, but still warm enough to mold. 6. Lightly wet your hands, and scoop up a handful of caramel popcorn. Press it between your palms until it is a round, compact ball that holds together. Insert a skewer in the top of the popcorn ball. 7. Continue to mold the popcorn into balls until all of the popcorn has been used. If your hands start getting sticky, re-wet them as necessary. 8. If you're not serving them right away, wrap popcorn pops individually with cling wrap or waxed paper and store them in an airtight container at room temperature.